Renzi says he’ll seek a government through the end of the current parliamentary term, which ends in 2018. The NCD’s leader, Angelino Alfano, who has served as deputy prime minister and interior minister in Letta’s government, supports Renzi’s move — for now. But Alfano’s role (and the NCD’s role, more generally) will likely shrink under a Renzi-led government. Alfano cautioned Renzi and the Democratic Party that he’s not going to lend support to anything more than the existing agenda of the Letta government — enacting a new election law for Italy and instituting reforms to liberalize the Italian economy. Alfano has already scoffed at the idea of extending the government’s current term through 2018. After all, it’s Alfano — and not Renzi — who will ultimately decide when Italy will next go to the polls. Despite their current split, Alfano is likely to campaign along Berlusconi’s Forza Italia in the next elections as part of the border centrodestra (center-right) coalition. If Alfano and Berlusconi think they’ll do better in elections next year than in 2018, Italy will go to the polls next year. It’s also hard to see how anyone, Renzi or otherwise, could lead an essentially unelected government for the next four years without going to the Italian electorate for a mandate, especially if Renzi can achieve the economic reforms that eluded Monti and Letta — and that Berlusconi’s past governments did not prioritize. It’s not clear whether Letta will have a role in the Renzi government While Renzi could offer him a post like foreign secretary, Letta may prefer to recede into the background, given the frosty relationship between the two rivals. Attention will turn shortly to the rest of Renzi’s government, which could bring a wider range of experts from the private sector into several Italian ministries. Luxottica CEO Andrea Guerra could join the government as finance or economy minister, for example, as might Lucrezia Reichlin, who has worked at both the European Central Bank and the US Federal Reserve, or Lorenzo Bini Smaghi, a former ECB execuive council member who has spoken out against ‘austerity’ policies in Europe. As Alberto Nardelli notes, if Italy doesn’t hold elections until 2018, it means Italy will have gone ten years with unelected prime ministers — Berlusconi won an obvious mandate in the April 2008 elections, but Napolitano appointed Monti in November 2011 to lead a technocratic government. Pier Luigi Bersani (and neither Letta nor Renzi) led the Democratic Party in the February 2013 elections, and he certainly didn’t campaign on the idea of leading an unwieldy grand coalition government. Yet Renzi faces enormous risks in the months ahead. First, by taking the premiership now instead of waiting for an electoral mandate, Renzi risks becoming part of the gridlock and inaction that he’s campaigned against for the past three years. By the time the next elections come around (in 2015 or in 2018 or whenever), Renzi could lose much of the appeal that’s brought him, so quickly, to the zenith of Italian politics. That could embolden the Italian right, far left groups or breathe new life into Beppe Grillo’s protest group, the Movimento 5 Stelle (M5S, the Five Star Movement). Moreover, opinion polls show that most Italian voters oppose Renzi’s immediate power grab. Secondly, Renzi will be working with the same fundamentals as Letta. Renzi will probably win an early victory with a new electoral law, and the Renzi-Berlusconi blueprint is already working its way through the Italian parliament. Economic reforms are another story. If they were easy, they would have been enacted long ago. It’s farfetched to think that Renzi, by force of leadership and personality, will unlock the competitiveness of Italian exports, liberalize Italy’s labor market, roll back a mess of bureaucratic regulations, reduce some of Europe’s worst corruption, and boost an economy that hasn’t grown by more than 2% since the 2000, all with a festering regional economic mess that’s left southern Italy one of the poorest places in the European Union. Thirdly, Renzi also faces the prospect of a humiliating defeat in the upcoming European parliamentary elections. Though Berlusconi might be more willing to deal with Renzi than with Letta, there are certainly more political points to score in opposition, especially as European elections approach in late May. Berlusconi is already waging a largely anti-Berlin, anti-Brussels campaign, and polls (incredibly) show that the centrodestra wins more support today than the centrosinistra (center-left). So don’t expect any major progress on reform in the next three months. Moreover, if the Italian right triumphs in Italy’s European elections, it will weaken Renzi’s position, and Berlusconi and the Italian right will be chomping for early national elections. 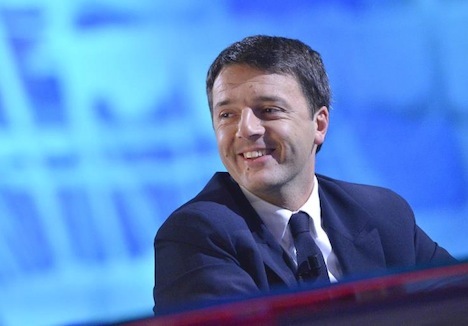 Finally, Renzi could face an insurrection within his own party. Fassina and a certain sector among the left wing of the Democratic Party already distrust Renzi. The Democratic Party’s main electoral ally, Sinistra Ecologia Libertà (SEL, Left Ecology Freedom), a socialist party led by Puglia’s openly gay regional president Nichi Vendola, refused to join Letta’s government, and Vendola earlier today criticized Renzi’s power play. If Renzi tries to enact reforms that are too neoliberal, he risks alienating much of his party’s left flank. Furthermore, while the Democratic Party leadership today supports Renzi, that’s largely because Renzi is the only credible option standing, not because they’re in love with Renzi. Old-guard party barons like Bersani, former prime minister Massimo D’Alema and the leadership of Italy’ labor union may back Renzi today out of necessity, but it was only 15 months ago that Bersani routed Renzi in the contest to determine the prime ministerial candidate of the centrosinistra. Letta’s government faced significant hurdles from the outset. By the autumn, it was clear that Berlusconi, convicted and sentenced on tax fraud charges, faced expulsion from the Senato (Senate), the upper house of Italy’s parliament. In October, Berlusconi tried to bring down Letta’s government, ostensibly over a 1% increase in Italy’s VAT, in a ploy to bring about snap elections. The move backfired, Berlusconi was expelled from the Senate in December, and divisions between the Berlusconi and Alfano camps split the Italian right between Berlusconi’s (larger) Forza Italia faction, which now sits in the opposition, and Alfano’s NCD faction, which remains in government. With a newly calibrated government, Letta barely had time to reassess his position when Renzi won the Democratic Party’s leadership in December and, from almost the first day, Renzi found himself walking a tightrope between advancing his urgent call for immediate change and avoiding the appearance that he was sabotaging Letta’s government. Given the awkward dance between Letta and Renzi, there were signs that the status quo wouldn’t hold, especially in the past month. Renzi picked a high-profile fight in January with former deputy finance minister Stefano Fassina, a leader of the socialist ‘Young Turks’ faction of the Democratic Party, and the war of words between the two led Fassina to resign. Shortly thereafter, Renzi brokered a deal with former prime minister Silvio Berlusconi that outlined the blueprint of a new electoral law for Italy that reduces the significance of the Senate. Italy’s constitutional court struck down the current law, which dates from 2005, as unconstitutional, making it logistically difficult for Italy to hold new elections until it adopts a new law. the negotiations largely excluded Letta. Though Berlusconi’s Forza Italia will stay in opposition as Renzi takes power, Berlusconi has indicated in the past that he’s particularly willing to work with Renzi, whose moderate instincts have led Italian commentators to compare Renzi to former UK prime minister Tony Blair, whose ‘New Labour’ brand repositioned the British Labour Party toward a more market-friendly and centrist orientation. It’s also possible that Berlusconi sees in Renzi a bit of the moxie and political talent that market his own rise to national politics in the early 1990s. Impressive job, Kevin. Buon viaggio!